A challenging, hilarious, and mind-expanding puzzle experience for one or twotreasure your first time through. I may be the dumbest genius ever. At least, that's how I feel after playing Portal 2's fantastic single-player campaign. Many puzzles in the last third of the eight to 10 hours (perhaps less, depending on how clever you are) of its brain-bending puzzle “test chambers” had me convinced at one point or another that they were completely unsolvable, and that some bug or sadist game designer placed the exit just out of reach. I'd let out exasperated sighs as every attempt met with a dead end. I'd grimace in disapproval as I plummeted to my death for the tenth time. I'd consider surrender. Then, through either sudden revelation, divine inspiration, or total accident, it would come to me: use the orange Propulsion Gel to reach the energy bridge, then catapult across the chasm and shift my blue portal to the inclined surface (in mid-air, mind you) to launch me up to the ledge, grab the refraction cube and redirect the laser beam to wipe out the turrets and activate the switch! It's so simple, I can't believe I didn't see it until now. One half of Portal 2's brilliance is making me kick myself for not thinking of the impossible; the other is making me feel immensely satisfied with myself when I finally do, again and again. Note: while we've made every effort to avoid spoilers in this review, you cannot review a game without discussing what it does well and what it doesn't. Be aware that reading any review is going to take some of the surprise out of it. That achievement is made possible by the wondrous Portal Gun, the game's sole piece of equipment. Unchanged from the first game (except for some subtle but slick texture work and portals that can be seen through walls, Left 4 Dead-style) the easy-to-use gun reliably casts one orange portal and one blue portal against certain walls, allowing you to magically, instantaneously pass from one to the other, regardless of distance, obstacles, or line of sight, while preserving momentum. It's the ultimate non-weapon weapon, a sort of physics-based Judo-bazooka that redirects the strengths of energy and objects in motion toward its user's goals—including the user herself. Wielding it makes me feel more powerful—and smarter—than nearly any other gun in gaming. The third half of Portal 2's brilliance is its story. (Yes, third half. If Valve can disregard the laws of physics in its game, I can disregard the laws of math in my review.) Its chambers are cohabitated by hilariously well-written and acted characters that exude personality, despite none of them being technically people. All three major roles rattle off absurd dark humor and petty insults at every turn. Evil robot GLaDOS is in top politely murderous form right from the moment she appears on screen (spoiler alert: she's still alive! ), but Portal's show-stealing monotone antagonist is challenged for the spotlight by Wheatley, the bumbling, chattering robot who helps you escape. Fantastically voiced by British actor Stephen Merchant (basically playing the same mind-bogglingly stupid character from the Ricky Gervais comedy Extras), Wheatley's a doofus AI who makes you turn around while he hacks doors (he can't do it while you're watching). Also in the mix is actor JK Simmons, who lends his fittingly cantankerous voice to the founder of Aperture, Cave Johnson, whose comically sociopathic approach to science is second only to GLaDOS'. Sure, I saw the plot twists coming, but still looked forward to witnessing exactly how the characters would react. Through death, resurrection, revenge, and reversal of fortune, their charm makes what would otherwise be an empty and lifeless world feel boisterous and alive—and more than makes up for the player character being a faceless mute. It does all this and more while recycling very few of Portal's greatest comedy hits—there's nary a nod to dishonest cake, and the beloved Weighted Companion Cube makes only a cameo appearance. And the finale? Not challenging in the least, but a spectacular and extremely clever finish to the story, with extra points for those who've paid close attention to Mr. Johnson. 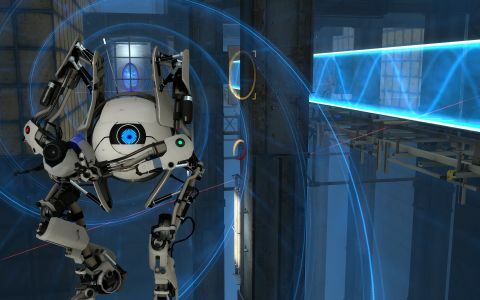 Without changing the nature of the established and celebrated gameplay, Portal 2's gentle learning curve begins by reintroducing us to its basic concepts, then keeps on introducing new inventions to use with portals until around three quarters of the way through, and chambers become complex jungles of hazardous obstacles. Lasers emitting from walls combine with moveable Refractor Cubes to create the closest thing Portal 2 has to an offensive weapon—an aimable laser—but more often your job is to focus the beam on trigger switches through portals. Infinitely useful Excursion Funnels (levitation beams) and Light Bridges are more than just here-to-there movers—they can be applied to block or push away turrets, halt a catapulting jump before it throws you into oblivion, or help you climb a sheer wall. I'm a little less wowed by the three flavors of viscous gel, which flow with a hypnotic globular effect from spouts and coat the environment in bouncy, speedy, or portal-receptive ooze. Unlike most of Portal 2's other devices, these have only a couple of uses at most, and can be difficult to control. It's a hassle when you're trying to paint an orange runway up to a blue bouncing patch that launches you through a portal cast on a white patch, only to have an errant blob of blue splash over everything. That's not to say that it's not great when your work of physics-defying impressionistic art comes together, of course. Locations are amazingly varied, as they must be to support this extended-length puzzle-athon without becoming monotonous. Aperture Science has fallen into disrepair in the indeterminate length of time between the greatly exaggerated “death” of its caretaker overlord and now, and many of its once-spotless test chambers are now rusted, grimy, and overgrown with vegetation. Maps shatter in front of our eyes as Aperture collapses on itself, while GLaDOS' hundreds of robot arms gradually repair and rearrange the chambers piece by piece. All of this scripted activity animates what would otherwise be still and samey-looking rooms due to Portal's lack of foes other than stationary turrets. The Aperture facility is far more vast than we could've imagined, and the quest to escape leads through its industrial bowels, a cavernous underground sewer-like area, and a long-forgotten retro 1960s version of Aperture, among others. Some areas are so dramatically different that even the basic button triggers and doors have unique looks to them, and everything is impressively modeled and textured, right down to the Easter-egg graffiti hidden throughout. Fine-brush touches extend to the sound, too, such as the wind wooshing in your ears during long drops, or tingly electric chimes that introduce themselves to the background music when you're speeding on Propulsion Gel. Between puzzles, Portal 2 is full of thrilling showcase moments, such as a mad-dash escape from an angry intelligence that controls the very walls, followed by a surprising take on the boss battle that, without a shot fired, made me feel dangerously out-classed next to my adversary. Right around that time is when the test chambers become increasingly elaborate and intimidatingly huge—to a fault in some cases. These jumbo puzzles are so immense that, even using the handy camera zoom function, spotting the exit can take a few minutes of exploration. Setting out to solve a puzzle when you don't know what objective you're working toward is the wrong kind of challenge, and some will find it frustrating. Later levels have multiple contiguous puzzles that can seem like they might never end, and made me miss the pace of the early game where I'd get a refreshing break between challenges. I always solved them, though. Even though a couple stumped me in a very serious way for up to a half hour, I couldn't give up until I made it to the other side. If you like a challenge, it's impossible to put this game aside until you've burned through all of it. Portal 2's story doesn't end with the single-player campaign, however. Read on as my co-op buddy Evan takes you through the entirely separate and equally innovative and interesting multiplayer campaign. I played the first Portal cooperatively. I always had a backseat driver—a roommate or a girlfriend—hovering over my chair, feeding what-ifs on where to sling my colored ovals. In Portal 2, Valve has officially supported that functionality, allowing you to share the burden of crunching your spatial options with another human brain. With the right sidekick, Portal 2 co-op is some of the most social gaming you'll have. The occasional headaches that you'd get when you're stuck alone are alleviated by communication and dimensional horseplay. You and your partner play as P-body and Atlas, a Pixar-esque Laurel and Hardy droid duo running the testing gauntlet at GLaDOS's whims in a separate, sillier story. They're not big talkers, only managing a few expressive squeaks and squeals of triumph and defeat, but their animations are lively and a joy to watch, and they've got some amusing celebratory co-op emotes. Five different testing zones are accessible through a massive hub room, for a total of more than 40 chambers (many of which are multi-part puzzles). Next to the single-player tests these puzzles are doubly complex, but co-op wastes no time babying you with tutorials—it ratchets up the difficulty immediately. Just the second one had us scratching our heads for several minutes trying to wrap our brains around the idea of linking our two sets of portals to achieve even-more-impossible feats that couldn't be navigated alone. A handful of puzzles are wonderfully distinct from what you do in single-player: in one, I guided Dan through a contained rat maze of spiked walls that resembled GLaDOS' grisly version of a Pachinko machine, carefully hopping on and off a pressure pad to reverse the direction of an Excursion Funnel to float him forward, juggling him back and forth to avoid death by giant stompy pile-driver while he cast new portals to change the path of the beam. Several times, Dan created a ceiling-and-floor loop that I'd fall through infinitely, until he re-cast one portal to launch me toward an objective at terminal velocity. Other rooms prompt careful timing: after many minutes pondering one, it finally dawned on Dan that we had to fling ourselves from opposite-facing portals and collide our bots in mid-air in order to safely land on a platform below. Gameplay-driven robot chest-bumps: Portal 2 has them. For the timing puzzles, there's an awesomely simple, non-verbal tool for syncing with your partner: holding the F key initiates a three-second countdown timer visible to both players. Two other tools tremendously supplement your (totally necessary) voice communication: marking, which lets you tag any spot or gizmo in the environment with a temporary pointer that's highlighted on your teammate's screen, and a seamless picture-in-picture toggle that shows you exactly what your buddy sees in the corner of your screen. Both are effortless to use and completely unimposing to the UI and gameplay, and between the two of them there's no confusion which acid pool he wants you to help him leap over. I love the way that trust manifests as a gameplay mechanic, and the instant, painless respawning leaves room for antics: every few stages, I'd grief Dan a little bit by keeping him trapped in a levitation beam, moving a portal to remove the Light Bridge from under his feet, or overwriting his portal with mine at the last moment to steal a launch we'd set up. There's also a fair amount of making fools of yourselves. In one of our prouder moments as a team, Dan and I spent 10 minutes trying to outsmart an Excursion Funnel/Faith Plate combo. We were so busy activating switches and scouting the room for new options that it was some time before I realized that we'd forgotten the most basic part of Portal science: you can walk through the portals, not just send things through them. From beginning to end, the co-op puzzles are excellent but brief. Dan and I zipped through all 40 in around four hours, which means you'll be able to finish both the single-player and co-op modes in a long weekend—partly because you won't want to stop playing. It's a minor shame that Valve didn't use co-op as an opportunity for a handful of optional, brutal obstacle courses like Portal's challenge chambers—some of those take a weekend to work out. It makes us both a little sad that, having played through once, we can never look at these puzzles—in either single-player or co-op—with those same bewildered eyes again (barring, as Aperture would call it, “a very minor case of serious brain damage”). The included developer commentary, and of course an encore performance from the cast, would be the only things that might make us start playing again after Jonathan Coulton's new song, “Glad You're Gone” (which is good, but “Still Alive” is a really tough act to follow) rolls with the credits. For that reason, our strongest words of caution are to choose your co-op partner carefully. You only really get one shot at these puzzles—don't waste them with someone who's already been through, as that would spoil the many surprises and the victory of discovering them for yourself. We'll definitely remember all of Portal 2 fondly, though, and as one of the best-written and finely polished gaming experiences in recent memory.